Unlike the high–end guitar market, where most of the emphasis is placed on recreations of classic, vintage instruments, many luthier–built bass guitars tend to strike a more unique form and style. 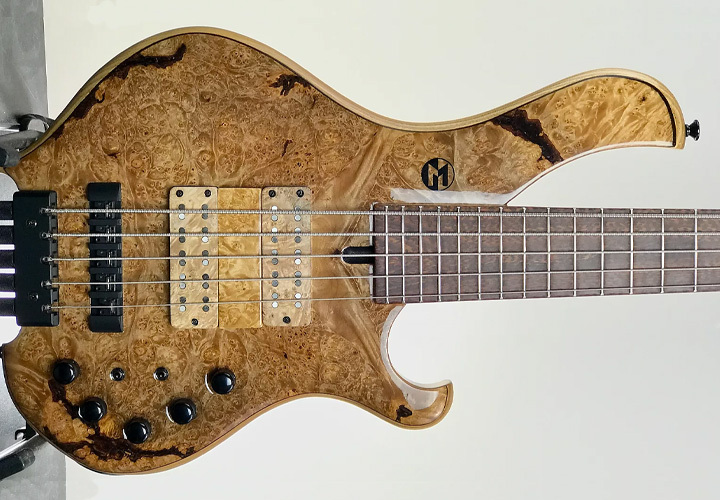 Features that are often rarities with mass–produced brands, like exotic tonewood tops and custom–wound pickups, are a dime a dozen with these creative one–off and small–batch instruments. As such, there’s nothing standard about these luthier–made designs, and we wanted to showcase some of our favorites. 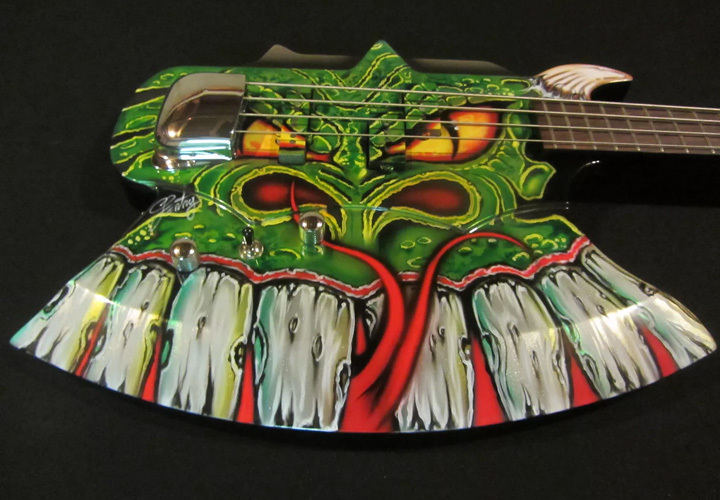 How do you make a Cort Gene Simmons Axe–2 look crazier than it already is? Hand paint it to look like a slimy, green serpent. 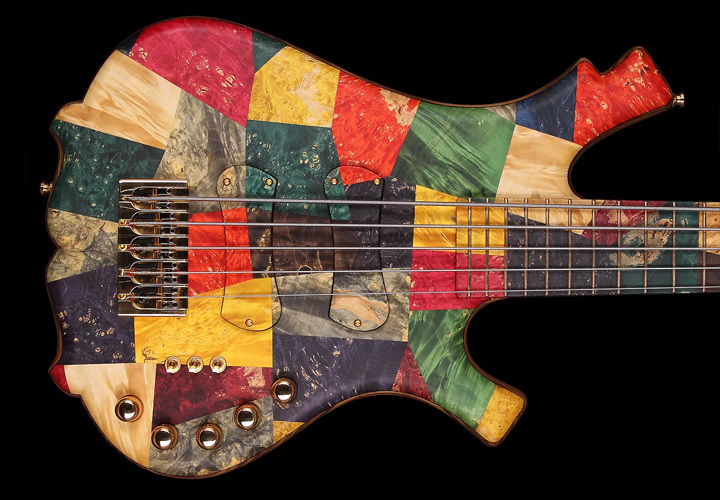 This bass was painted by Gentry Riley himself — an airbrush artist of almost three decades who is responsible for some of the custom painted guitars Gene Simmons has played on stage. The only part of this bass that hasn’t been custom painted is the back, which remains black. Otherwise, it’s a snarling dragon, complete with metallic touches on the teeth, painted Mitey Mite pickups, and a scaley headstock. This Bulgarian–based builder spend two years making this instrument for presentation at the 2016 Holy Grail Guitar Show in Berlin. The body is made of an elm tree core, with multiple irregular pieces of colored maple that are all stabilized. Stabilization strengthens and protects the wood against high and low temperatures and high and low humidity environments. The neck is made of flamed maple with ebony stripes, a purple heart cone core, and maple veneer lamination. The pickups are also handmade by KD and are fitted in wooden boxes to match the rest of the colored bass. 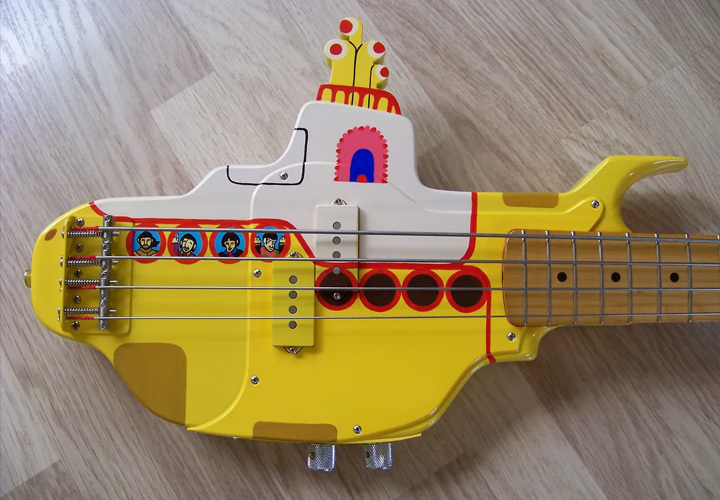 The first thing that must be acknowledged about this bass is that it’s massive. 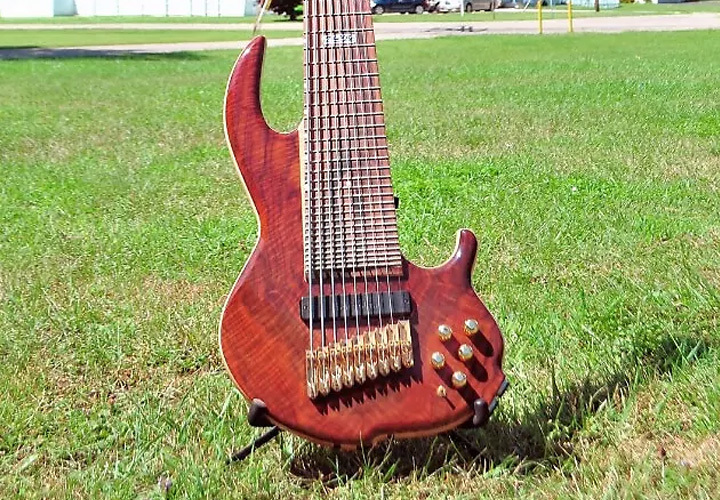 It has nine strings and 36 frets along the neck. It can make even the most grown men appear far smaller than they actually are. It’s a monster. But according to the seller, it’s a playable one, with a thin neck, tight string spacing, and reasonable balance. This acoustic bass is as much a piece of art as it is an instrument. It’s the third in a series made by the Quebec–based luthier of Andre’s Instruments. The instrument features an Alaskan yellow cedar top plate with an adirondack spruce, padauk, and carbon fiber bracing blend. It features an ebony fretboard, a Canadian roasted rock maple neck in its natural color, and a medium output Dimarzio DP–145 Will Power pickup. 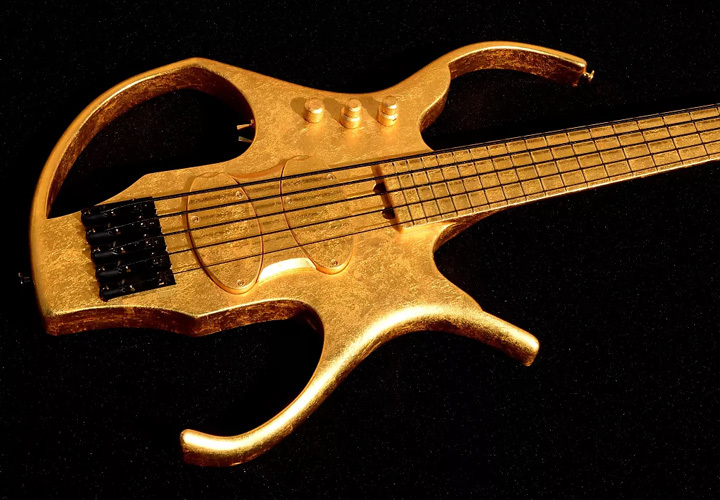 Ritter Instruments’ bass guitars are truly some of the most outlandish designs out there. Entirely made by hand, the brand is committed to producing unique instruments made of exotic tonewoods with otherworldly finishes at the highest possible quality. There are a few Ritter basses on Reverb right now that could have all easily landed on this list, but today we were feeling this one. 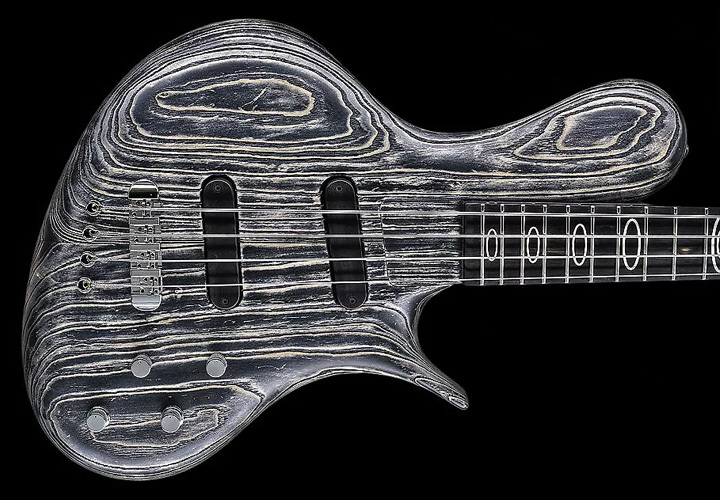 The body is made of swamp ash in a sandblasted black finish with a maple neck and an ebony fretboard. 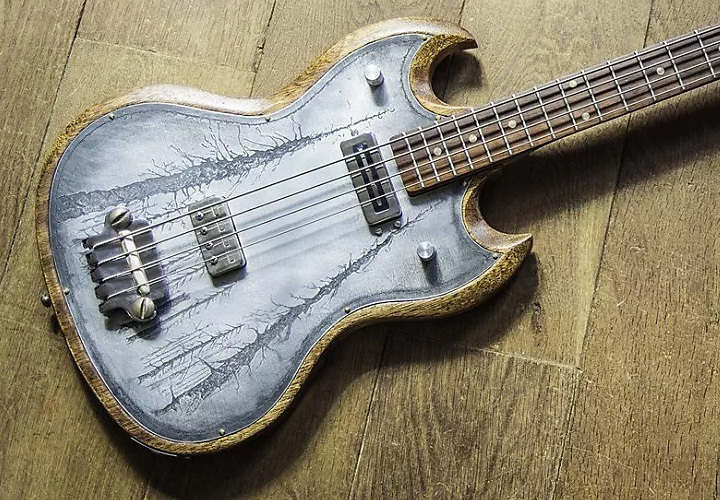 This bass oddity is a direct tribute to the Beatles, crafted by the UK–based Painted Player Guitar Co. The body was carved from an alder Mexican Fender Precision bass body and is married to a Fender neck with Fender electronics. Buyers willing to pay the full asking price will also receive the custom hard case (pictured in the listing) for free. 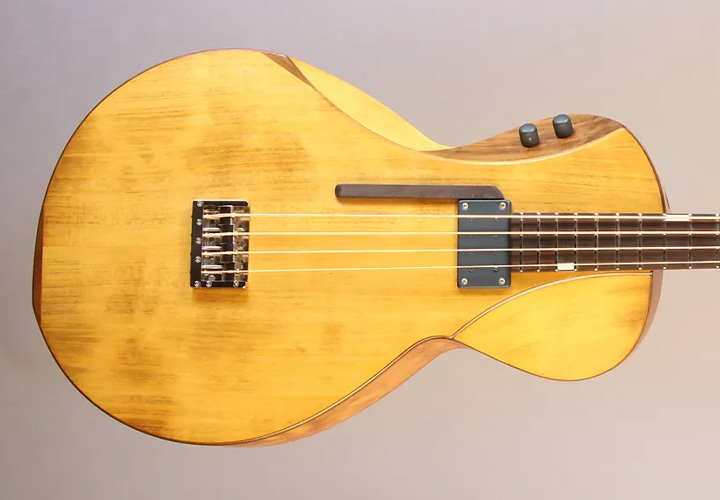 There really isn’t one ordinary feature when it comes to this one–of–a–kind bass guitar by French luthier Paul Lairat. The shape is entirely unconventional, with odd horns and a strange cutaway. But perhaps most unconventional is that the entirety of the instrument is covered with genuine gold leaf — complete with the price tag to match. This bass boasts a super low action for easy playability, stable intonation, and impeccable balance. It features two Haussel Jazzbucker pickups, with maple burl pickup covers to match the maple burl–topped ash body. The through–neck is comprised of five pieces with a snakewood fingerboard, and most importantly, no headstock. 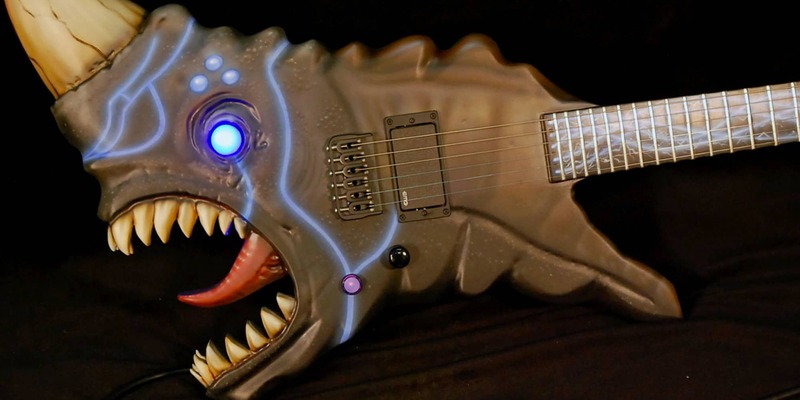 This bass was featured at the 2014 Japan EXPO in Paris, France. The semi–hollow body is made of alder with a figured Japanese horse–chestnut top. The controls are nested in the body’s cavity. 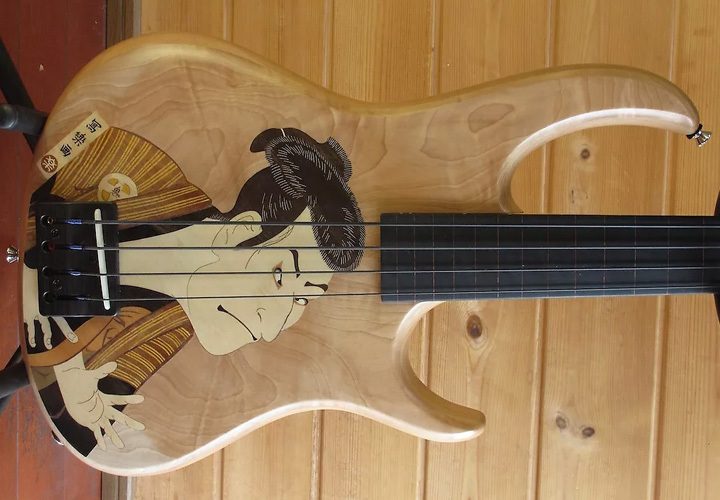 The coolest feature of this fretless bass is the custom “Tozoku” (meaning “bandit”) inlay done by Japanese inlay craftsman Haruo Uchiyama. This bass is a modified, made in Japan EB3 from 1971. An engraved zinc top featuring a dark and foggy, forest–like scene with long scraggly trees (based on a painting by Xavier Guillaumin) has been placed on top of the wood body. It’s fitted with German NOS pickups and, in step with the forest theme, features nuts made of deer antler. Behold the aliens, the eagles, and the ergonomic oddities.